The British Gardener - The Tropical years: Knock Out Rose - The new Elm? I have a doomsday concern that I touch on a few posts back that has made me very worried. 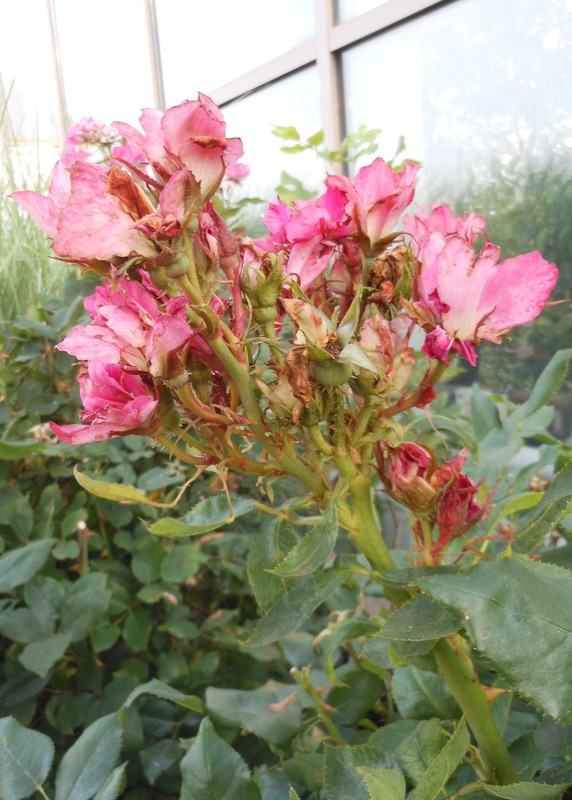 I've noticed that Knockout roses are begining to show a weakness that should a disease successfully penetrate its armor it would spread rapidly through their population due to the frequency of their mass planting. If we look back in history we have seen epidemics like this in the fate of American Elms and Chestnut trees. The story of these two great American trees is one of introduced foreign pathogens and the trees inability to adapt to the new danger. The countries where the diseases came from had similar species that had co-evolved with the diseases and could survive an attack but on foreign soils the diseases had free reign. Chestnut and Elms occured in such great frequency that a disease could skip from one tree to another without having borders to contain its spread. Their stories are quite interesting and worthy of further reading but I'm getting off track. Knock out roses were hailed as the greatest thing to happen to roses since the introduction of the first, single red in 2000, that was chosen for the 'All American Rose Selection' award. Easy to care for with a long flowering period without the need to dead head and disease resistance. Couple all of this with an agressive marketing campaign and you have an instant winner. Pretty soon all the customers were coming in brain washed to say 'Knockout rose, Knockout rose'! Now the new problem was that none of the other roses were selling even if they were also disease resistant. After that, they took over like an invading army, sweeping across commercial landscapes to developments and into our own back yards. I admit to owning one, a beautiful double pink that I bought for my wife as a Valentine gift, though at that time just a pot of bare stems in February. It lives up to all the expectations and hasn't disappointed yet. This year we have seen the increase of an incurable disease, 'Rose Rosette Disease', probably brought on by a mild winter and the increase of mite infestations. It was first described in 1941, tied to the increasing popularity of the Japanese Multiflora roses, recommended at that time for erosion control, living fencing and to attract wildlife to your garden. The negative was that the Multiflora rose is greatly successful at producing a lot of viable seeds that will take over and choke out other plants. Multiflora roses are highly susceptible to Rose Rosette Disease and at one point it was suggested that the disease be used as a biological control to stop the spread of Multifloras. However the disease quickly spread and transitioned into cultivated roses and has remained in our gardens. The disease is known to be spread by 'eriophyid' and 'rose leave curl' mites, which are easily transported in the wind up to 100 yards from its orignal source due to their extremely small size. Just being down wind from infected plants will put you at risk. Symptoms don't show immediately and detection of the mite is near impossible unless under a microscope, which even then are difficult to see. Once the contorted stems begin to show the only control we have is to remove infected plants as quickly as possible. The disease will enter the plant it is spread through its vascular system so pruning affected areas is not an option. It is not believed to be a soil borne disease so new roses can be replanted as long as the old rose's roots are completely removed. It's ironic that the success story of the Knockout rose could be its down fall due to its susceptibility to Rose Rosette Disease. Unfortunately the mass planting of Knockouts across the country will act as a highway for the mites to travel in the same way it swept through the Multiflora rose population. I'm hoping I'm wrong but evidence seems to weigh in favor of this prediction that the knockouts may be down for the count! As you know (since you helped me diagnose it!) I've lost one rose to RRD this year. I don't have any Knock Outs as they are everywhere else so I never felt the need to plant any as I can see them constantly - highway medians, shopping center lots and in almost every suburban yard in which a person has a passing interest in flowering plants. The double pinks sure are pretty though. I've mentioned to a couple neighbors about RRD and showed them my rose before I trashed it and neither had ever heard of it. Knocks Outs seem so carefree that I'd bet that most people and places that have them planted will not noticed how diseased they are until they are truly dying. That will mostly likely cause the disease to spread faster, yes? You’ve brought up a good point that not many people realize that the rose has a disease at first. The mutation of the stem is localized so many, including myself would of just pruned out the limb and thought nothing more of it. However, I’ve been told that from first sign to death is around 2 years so it’s not sudden. The disease hasn’t been officially classed yet and acts more like a virus in the way it works making it hard to control because it needs to invade a living host to proliferate. I hate to bring down such a popular flowering plant but it’s the sheer numbers being sold that ar e leaving it open to problems. The double pinks sure are pretty though. I've mentioned to a couple neighbors about RRD and showed them my rose before I trashed it and neither had ever heard of it. Interesting piece. I want to dig deeper into the science of how foreign introduced plants respond to environments that have a different biodiversity. I know that even bringing in sod grown 100 miles away can change the biodiversity in a garden because it's introducing new organisms in local soil. So it certainly makes sense with everything else we bring into our gardens. I suppose there is a lesson here, but I can't find it. Your a rare breed to take extra steps in preventing the spread of a possible invasive plant, but at the same time appreciating it for its beauty and garden worthiness. I was faced by having to defend selling Japanese Honeysuckle at the garden center I work at. Its not banned by the state of Virginia so we sell it because people ask for it. However, I work for a business that sells plants and I have an obligation to do that regardless even if I know what the outcome may be. A difficult situation to be in. Doug Tallamy book, 'bring nature home', is excellent read into how non indigenous plants affect wildlife. However, Jennifer Owen's, 'Wildlife of a Garden' proves that gardens with a high number of non indigenous plants attract as much wildlife. Thanks for commenting. Hi, Rob. I'm down the road from you in Hartwood, Stafford County. I have a large collection of mostly historic roses, and RRD is a particular concern. I do what I can to spread the word. Watching commercial stands of Knock Out infected with RRD be ignored by landscape crews, despite my warnings, is frustrating. In fact, I'm giving a talk about RRD to the Richmond Rose Society on Sunday, Jan. 27. The goal is to educate novice gardeners so they can recognize the symptoms and deal with infected roses. The only chance we have is to limit the source of infection ... a losing battle, I'm afraid. Your analogy between RRD and elms and chestnuts is a good one. I'm off, now, to see what else this blog of yours has to say. It's great to 'meet' a neighbor. Thanks for reading. I fear the RRD goes beyond landscapers, maybe all the way to plant producers. The economy has pushed everyone to their limits and I worry that some may prune back infected stock so they can sell it, rather than disposing of it the right way. Confusion over how serious this virus really is has delayed action. Although I can't name names, I do know one very large nationwide grower is scaling back its production unless a cure can be found. Hi Rob, As a Brit you may remember a regular columnist in the horticulture press call 'Woodsman' I am reminded of him as he often stirred up controversy with some ill-founded jottings and was oft referred to 'Backwoodsman' for that reason. I bring this up as I feel someone needs to defend the poor knock-out rose. I certainly take your point that the massed plantings of knock-outs are a great breeding ground for RRD - but then so are the massed plantings of nearly every other rose variety or specie, indeed... what about the wild multiflora that grows in numbers greatly in excess of any cultivated rose, throughout the Southern and Mid USA and has been reported as the main culprit in spreading this noxious disease? There is no doubt that steps must be taken to control and eradicate RRD but the real culprit is the disease carrying mite and the solution lies in a regular preventative spray program to kill the mite. I know that the health and safety gestapo have removed from sale some of the most effective insecticides (I know, I know, there is a good reason!) but there are others such as Avid and a policy of regular preventative spraying will certainly stop the spread. So, come on Bob, give the poor knock-out a break, they have given millions of us pleasure as we drive past the drifts of colour that simply knock me out each time. Your defense of the Knockout is justified and I apologize if my attack came across negative. I've seen how rapidly the sales happened across America and how everyone now has one. Its been a huge success and helped many people in the industry keep business going in tough times. However, the success of it's popularity could be it's downfall as the virus spreads. Tackling the source of infection is definitively the best way to deal with the virus but we don't have an sound environmental method to do this. To further the defense of Knockout rose, its creators are investing a huge amount of money to come up with viable control methods. At least their not running away from the problem after cashing in all these years. Thanks for writing.